You are vulnerable. That’s a given. By the time that DDoS attack strikes, it may be too late. MazeBolt has been helping large organizations prepare for DDoS attacks for almost a decade. 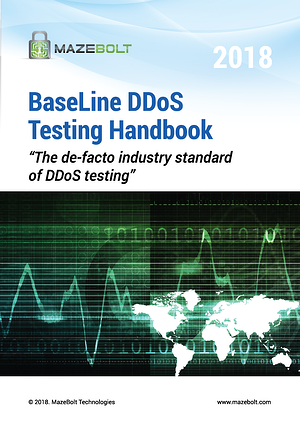 We invite you to download our BaseLine Testing Handbook that explains the BaseLine DDoS Testing methodology, so you can understand how to best prepare your organization before that attack happens. On average, BaseLine testing shows the average enterprise’s DDoS defenses has a 40% vulnerability rate to the most common attack vectors. Using MazeBolt’s proven DDoS testing methodology - on average, you get a 60% reduction of DDoS vulnerability within only two testing cycles. Gain comprehensive understanding of your DDoS defense vulnerabilities and plan for short-, medium- and long-term improvements using MazeBolt’s methodology.